The Pick3 Special Users Group web site is certainly on top of the list of suggested web sites. The site provides for its members a huge variety of quality forecasts, tools, wheels, workouts and especially prediction systems. On this site you will find what you are looking for. And if not, no problem: You are always on one phone call or one email away from the PICK34 SPECIAL USERS GROUP support Bill is helping users and members for years now and will always be able to get you on the right track with explanation of certain tools or systems, or with advice and examples. The Power Forecast 3 and 4, the Rower Up Collection, The Quick Predict X software, Jack's Magic Wheel and the hottest tool around the Number Combination Slasher. The latest new system, the Predator II, can currently be used in the group. The system still in the final stages and will soon be ready for download. But join the group and check it out now. 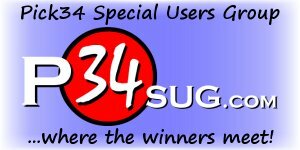 The impressive results are shown in many messages in the LOTTERY SECRETS GROUP, the Yahoo forum were you can meet current members and software users and learn about and from their experiences. Take a look at the group and join at least for a trial period or a month. You will see that the powerful contents - you will find all the software available in the Store on the Site - the customer service and the friendly environment is well worth it.